So much to do this week weekend and it's only TUESDAY. For starters, if you're wearing shoes today, go ahead and kick them off in support of One Day Without Shoes, a global event to raise awareness for children's health and education. It started at Pepperdine University in 2007, – originally dubbed Sole Streaking – and grew exponentially once TOMS embraced the idea and expanded the movement to more than 50 countries, 230 companies, 500 schools and more than 1,000 events. Speaking of events, TOMS Flagship on Abbot Kinney will be hosting a full schedule of barefoot fun (see flyer above) including barefoot yoga, a kids' barefoot book read and then a happy hour grape stomp. 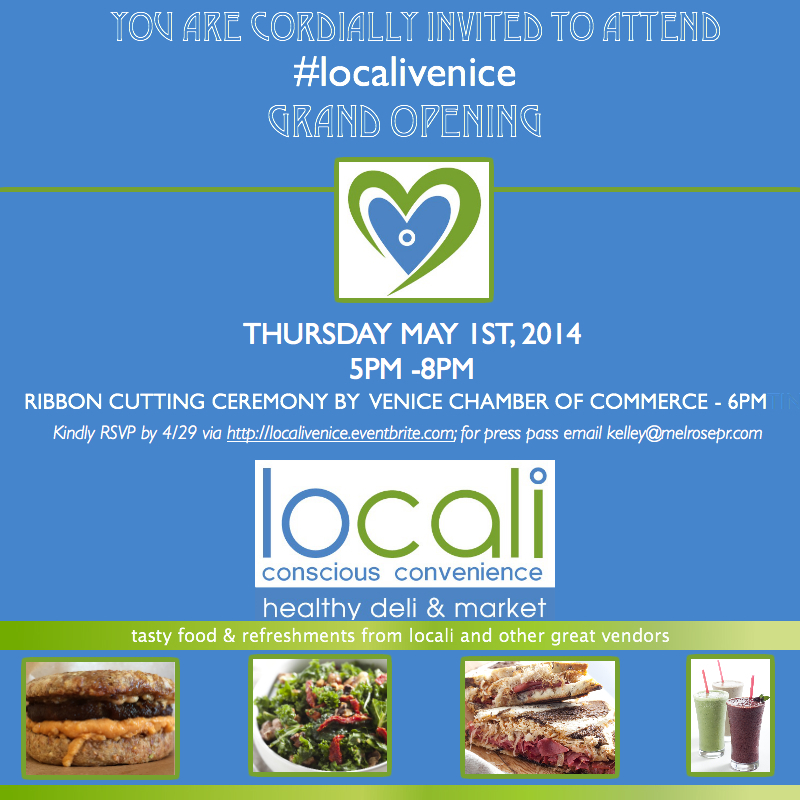 THURSDAY evening, Lincoln's new healthy deli, Locali, will be hosting its grand opening party, so you can stop over for a bite. The turkey Reuben is top notch (not everything is vegan) and Zagat just ranked the Badass Breakfast Sandwich as the 7th best new sandwich in LA. Then, go see the Venice Made art show on Main Street. It's the FIRST FRIDAY of May, so you can grab a bite at the food trucks along Abbot Kinney, or you might save yourself for an early start SATURDAY at the Venice Garden and Home Tour. 30 homes on walk streets east of Abbot Kinney and others adjacent to the Boardwalk will be open from 10am to 6pm to peruse, including Eric Clapton's former digs on Paloma. Get your tickets here! (It's for charity and tax deductible.) Find out where you can rent a bike here. If you're still not satiated on art, design or wine, SUNDAY is your day. Artblock is a free community event featuring 30 open art studios throughout Venice with coordinating bus loop to get you around town. Check out the map here. Did we mention it's FREE? While you're enjoying the open studios, pop into Big Red Sun on Rose Ave for a wine tasting hosted by Simon's Market. Annnd, don't forget that MONDAY is Cinco de Mayo! We'll have lots of events posted up for you in a couple days, but in the meantime, here's a stay-at-home recipe for chicken chile verde and fresh margaritas.